Since my family was faced with financial difficulties leading into the 2013-2014 school year, we did not have the available funds to purchase the curriculum we had used in the past. 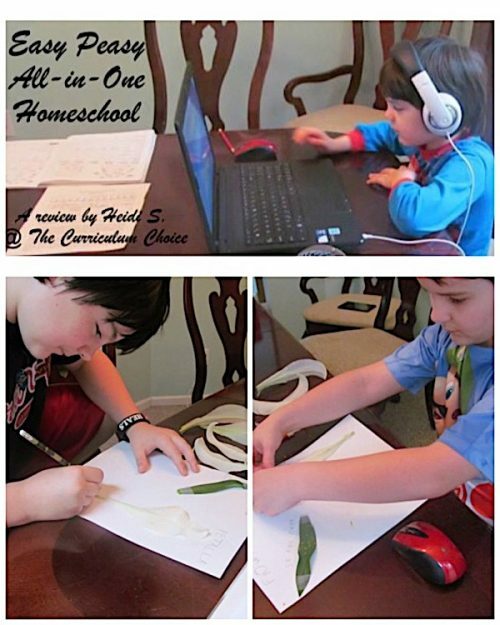 In my search for free or low-cost programs, I found Easy Peasy All-in-One Homeschool. I would like to share our experience with this free, all-inclusive program. Lee Giles is the author of this program. She has spent countless hours creating and improving it for her children and has blessed us by sharing it. You can read about her and the program here. The name of the program says it all, it truly is All-in-One! She offers complete curricula for preschool through high school. Everything you need is included with very little additional supply cost. It is a complete curriculum. All subjects, including core subjects, foreign language, physical education, art and many more. You have the option to either complete the level as a complete curriculum or pick various subjects in various levels. My Kindergartener worked in Getting Ready 1 and 2, as well as Level 1 for math. My 2nd grader worked in Levels 2 and 3 for different subjects, and my 5th grader completed Level 5. The program promotes a Biblical worldview. The only cost associated with this program is paper and ink to print the few required printables. Many of the assignments have the option to print or complete online. Most assignments can be done online and as independently as you desire. My 5th grader was able to complete his entire day independently when necessary, giving me more time to focus on my new reader. This is something that was a bit of a struggle for him in the past, but with Easy Peasy, he worked so well by himself. The instructions for the assignments are conversational and easy for the students to understand. One of my favorite things is that the assignments sometimes instruct the student to tell a parent what they read or learned and often awards the student with a hug from a parent and I am always happy to oblige! My kindergartener loved the math songs that are assigned almost daily. We even turned them into a family dance session at times, giving us a much-needed break in during the school day…everyone joined in the fun! My 2nd grader loved the Thinking assignments. They were challenging but always fun. 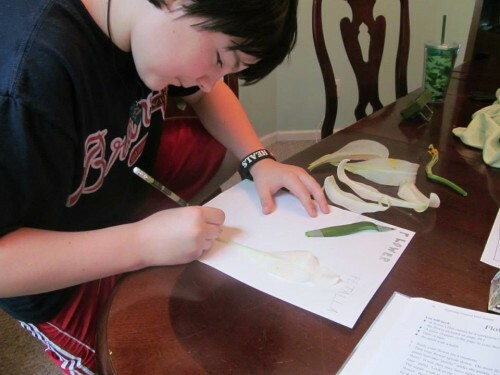 My 5th grader’s favorite things about Easy Peasy are the many hands-on projects. He also loves that busy work is a thing of the past. The lessons are short and to the point, freeing up more time for family fun and learning outside of the curriculum! If you are looking for a complete, Christ-centered curriculum, I urge you to take a look at Easy Peasy. We have been so blessed by the ministry of Lee Giles. 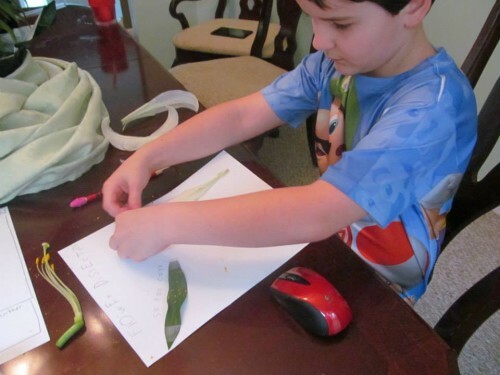 We plan to use at least parts of Easy Peasy as we continue our homeschooling journey. Isn’t it great? We love the freedom and flexibility of the program! Someone told me about your review, so I came to take a look. I’m so glad you found the curriculum and that it’s blessing your family. It’s an encouragement to me to hear that it was a provision when you needed it and enjoyed as well! Thank you so much for sharing your ministry with others. It was and will continue to be a blessing to my family. I am searching for free curriculum for my family due to low funds as well. We tried Easy peasy once before and I think we will be using it again. Thank you for the review! how cool that Lee commented on here. Was there anything about the program that you didn’t like? I like the hear the cos, too. Thank you! The only thing I can say negative about it was the occasional pop-up ad that would show up on some of the outside websites, but that really cannot be avoided when dealing with the internet. I did install the recommended ad blocker and it really helped. I also want to ad that there are NO ads on the main Easy Peasy pages. I do use some other resources that I have grown to love in place of some of her recommendations, but the program could certainly stand on its own. Even when we used an expensive boxed curriculum, I changed things up a bit. That is one of the benefits of Easy Peasy, the courses are listed separately so you can pick and choose between levels and subjects. I just love EasyPeasy as well! It is so functional for big families and I also enjoy the Charlotte Mason approach to learning…thanks so much!! You bring up a good point that I missed! Yes, the Charlotte Mason approach is a definite plus to the Easy Peasy program. I used easy peasy for one semester. My worry was ‘Are my children learning how to write proper essays?’ Has anyone finish this curriculum to say their child (ren) successfully enter college? Although my children (5th and 7th) enjoyed and claimed they learned more from this, should I continue my concerns? Please respond if anyone has child(ren) in college after this. I have 4 hs grads with 3 in colleges-majoring in physic, engineering, and general studies and 1 completed military service. I’ve emphasized math and ability to write. My oldest just finished 6th grade so I cannot specifically address your concerns. Hopefully one of our readers can to help you. If you have access to Facebook, Easy Peasy offers many different groups for support depending on grade level, location, etc., which may be a good place to start. I am considering using EP this year. How are grades maintained? Are there tests? How do I know if my child(ren) are indeed “getting” the lesson? Thank you for your feedback. Great questions, Cherisse! I have only used the elementary portions of EP and there are no tests. The program does instruct the students to print out things along the way for a portfolio. The older grades may be different though. I suggest going to the website or the Facebook support page for this information. Thanks for such an awesome guide. I completely agree with what Heather said.EasyPeasy is acually so functional for big families. I love Charlotte Mason approach to learning too and would like to know your views on it. I am a fan of the Charlotte Mason approach to homeschooling. We are an eclectic homeschool family and use many different approaches in our curriculum choices; but when it comes to certain subjects, I believe that Charlotte Mason’s advice is best. We use many living books and spend a lot of time outdoors and just doing. I also have all boys, so they respond much better to hands-on, how-will-this-fit-into-the-real-world learning. I am trying to decide which homeschool program to use for my son this fall. He is has a learning disability and in elementary school was for the most part about 2 yrs behind other kids his age. Now he is ready to start 9th grade and I am not sending him to public school. He just learned how to multiply/divide this year so did my 3rd grader. I need something to let me know where to start with him. He uses the computer well, writing is a struggle. Somebody point in the right direction, please. Thanks for your review! All I’ve read are pretty awesome things about this FREE curriculum and I am seriously considering using this for my soon to be 2nd grader. I find it very easy to follow which is important for me! I am excited and already so thankful that something like this is out there! Is the whole curriculum done online? Our family uses Easy Peasy. ?I am thankful for the lesson plan organization. It is a complete program by itself. Although, we have stuck with the math program that has worked well with our family. My children who are in the high school level have had opportunity to write various types of papers at different levels of difficulty. They have not used the peer review, but is a great option and would provide good practice for forums in college courses.